Provide comfort for the family of Edna Couillard with a meaningful gesture of sympathy. The family announces with great sorrow her passing in Sudbury on Sunday, February 3rd, 2019 at the age of 94. Daughter of Italian immigrants Secondo Anthony Renzoni and Emma Furlani. Sister of predeceased siblings Louis Renzoni (Germaine), Elba Renzoni (Gino Volpini), and Carletta Renzoni (Michael Galvin). Wife of Gaetan Couillard predeceased 2002. Mother of Jocelyne (Len Miller), Gary (Lynda), and Raymond (Cynthia). Grandmother to 5 grandchildren Marissa, Lisa, Julie, Dan & Taylor and 2 great grandchildren Hunter and Isabel. 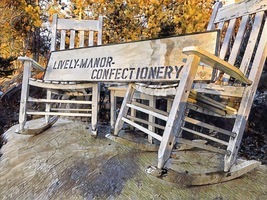 For 44 years Edna was the owner, manager of Lively Manor Confectionary store on the main floor of the tallest building in the small town of Lively. Edna held many titles: mentor, advisor, leader, LEGACY giver, teacher; however mainly that of a mentor and confidant; shoulder to lean on. She had an incredible air of generosity, fairness, acceptance and understanding. We will never know another person like her in our lifetime. A special thank you to York Extendicare 3rd floor staff for the kind and compassionate care given to Edna. In keeping with Edna’s wishes, there will be no visitation or funeral service. Arrangements entrusted to the Jackson and Barnard Funeral Home. For donations and messages of condolence, www.lougheed.org. To send flowers in memory of Edna Couillard (Renzoni), please visit our Heartfelt Sympathies Store. Consider providing a gift of comfort for the family of Edna Couillard by sending flowers. We are so sorry to hear of your mother's passing. Thinking of you and your family. To Cindy and Ray - So sorry for your loss. Thinking of you and your family.